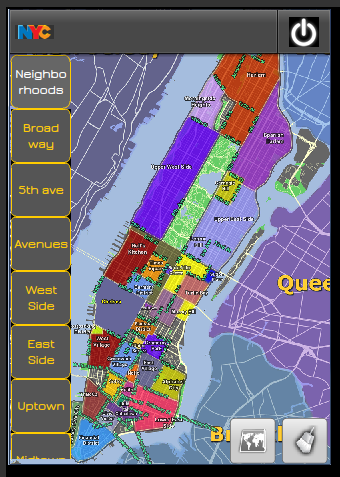 If you are visiting New York City and notquitesure how to get oriented in Manhattan or if you hearDowntown,Midtown, Uptown, West Side, East side but don't know whatit is,take a look. 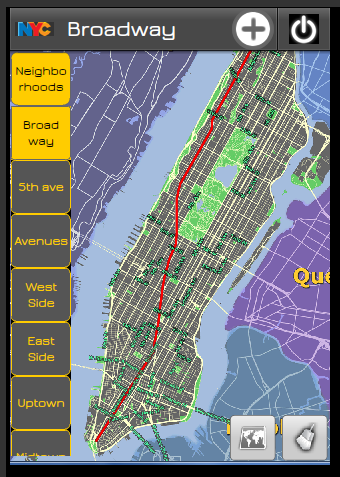 You can see all these notions on the interactive mapofManhattan. 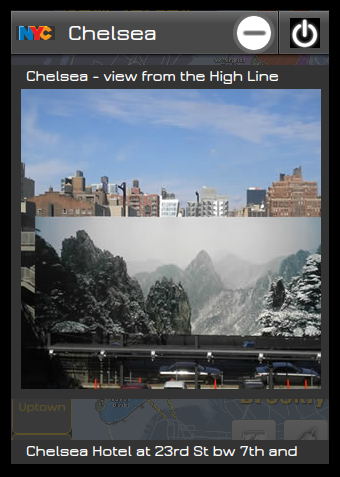 In addition to it, check out the photos ofeachneighborhood, see what makes it special and why you needtovisit. 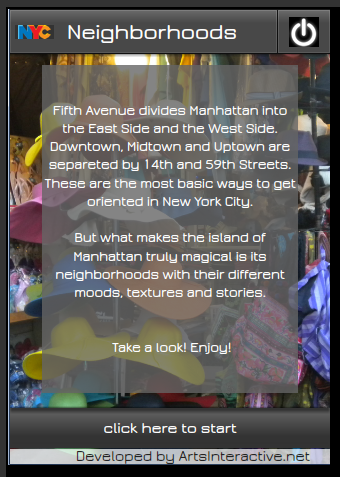 PortableNYC is a one-of-a-kind New York City guide that includeshistoric bars, restaurants, and major landmarks. Since drinking hasalways been such an important part of New York’s history and isstill such an important part of sophisticated travel, this NY guideapp features specially selected historical bars and restaurantswhich make New York history truly come alive. LEARN MOREABOUT THE BIG APPLEThis ny landmarks app is meant to be yourcompanion for discovering New York’s City’s big and small wonders.If you don’t like to lug around with a tour group but enjoywandering around, this is definitely for you! Statistically, onecan only retain about 12% of the information on a tour. WithPortableNYC, all 100% will always be at your disposal. POINT OFINTERESTS WITH DESCRIPTIONS & UNIQUE STORIESYou’ll discover thespots where the Fitzgeralds used to hang, where O’Henry used todrink, and where the Vanderbilts were “wonder building.” This isNOT a tour app, and will not lay out a specific path. Instead,it’ll point out notable landmarks on your way along whichever routeyou’re already following. Each point of interest specifies itsdistance from your current location and updates as you move aroundtown. Each POI comes with an address, navigation, and mostimportantly — a story! GET DIRECTIONS OR MAKE A RESERVATIONBased onthe CityGuide template, this app is intuitive and very easy to use.You can navigate to point of interest, share it, see your currentdistance to the POI, add it to “favorite spots”, and make a phonecall or online reservation.PortableNYC Guide FEATURES: - 20historic bars and restaurants where New York history is served withyour favorite cocktail, - 20 hidden spots for you to discover, - 20most known NYC landmarks which you must see One of the best newyork city travel guides!Wander the city! Be your own guide! 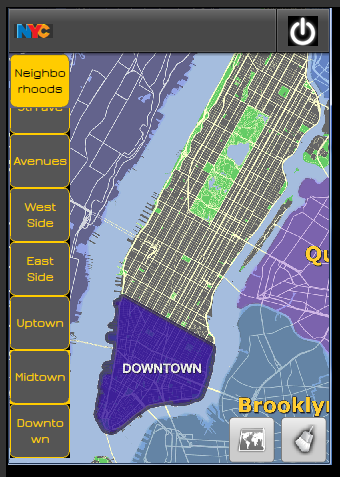 If you are visiting New York City and notquitesure how to get oriented in Manhattan or if you hearDowntown,Midtown, Uptown, West Side, East side but don't know whatit is,take a look.You can see all these notions on the interactive mapofManhattan. In addition to it, check out the photos ofeachneighborhood, see what makes it special and why you needtovisit.No Internet connection needed. Perfect for students and very useful for tourists and locals, it'sa very convenient reference on NYC history: dates, events andpersonalities.Main menu lets you choose a period in time in NYChistory so that you can see major events. If you want to look up aname or an event, you can just search for it. Divided into sections - 'Manhattan', 'NYC', 'Interesting Facts' and'Price Tags' - this app is a convenient pocket NYC reference filledwith statistical data and curious NYC facts. You can browse throughit or do a search.No Internet connection needed. Have you ever wondered what neighborhood you're in walking aroundNew York City? What about certain landmarks, or your ownapartment?locality.nyc is your source for New York Cityneighborhood information. Search by address, landmark, or geolocateto your current location. Neighborhoods are overlaid transparentlyon top of a Google Map, allowing you to see where you are block byblock.Data adapted from nyc.gov, Google Maps, and various sourceslisted on Wikipedia. All neighborhood boundaries are subject todebate.